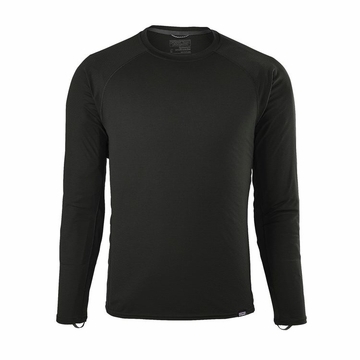 "Our lightest-weight, fastest-drying and best-wicking baselayer, with Polygiene permanent odor control and Fair Trade Certified sewing. The Capilene Lightweight Crew is made of our lightest-weight, fastest-drying and best-wicking baselayer fabric. A subtle grid pattern allows the fabric to sit lightly and comfortably on the skin, while the smooth outer face glides easily in any layering system. Highly breathable for high-exertion and warm conditions, the fabric is 100% recycled polyester treated with Polygiene permanent odor control. Features include a self-fabric collar with internal neck tape for chafe-free comfort, full underarm gussets for unhindered shoulder mobility, elastic thumb loops to help cover hands, flatlock seams that minimize chafing, offset shoulder and side seams that lie smoothly beneath pack straps, and a drop tail for additional coverage. Fair Trade Certified sewing.